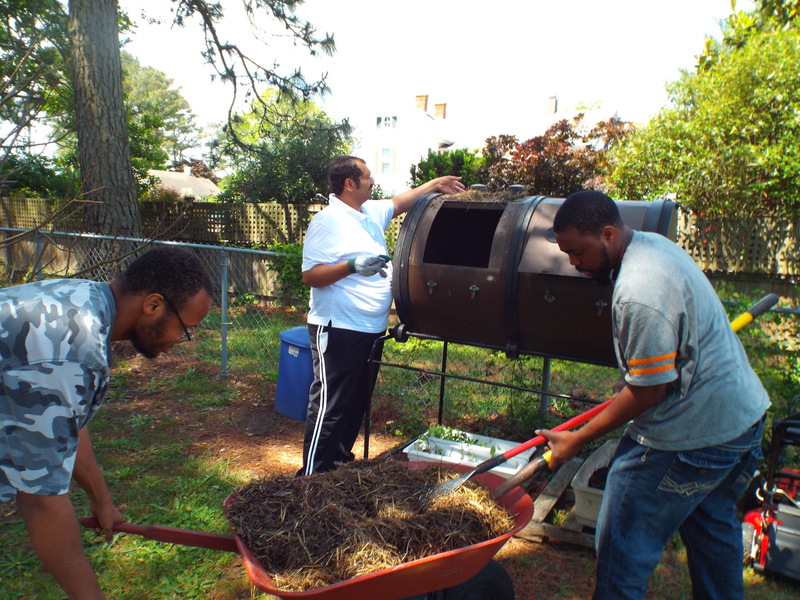 DJ, Zel, and Steve adding some old hay from our chicken coop into our compost tumbler! 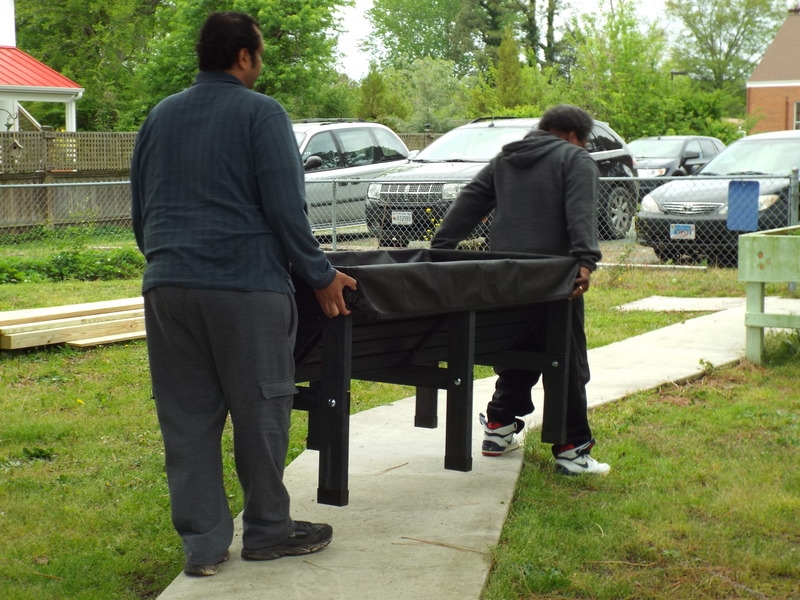 Maryann, Zel, Philip, and Rachel moving one of our new raised garden beds. 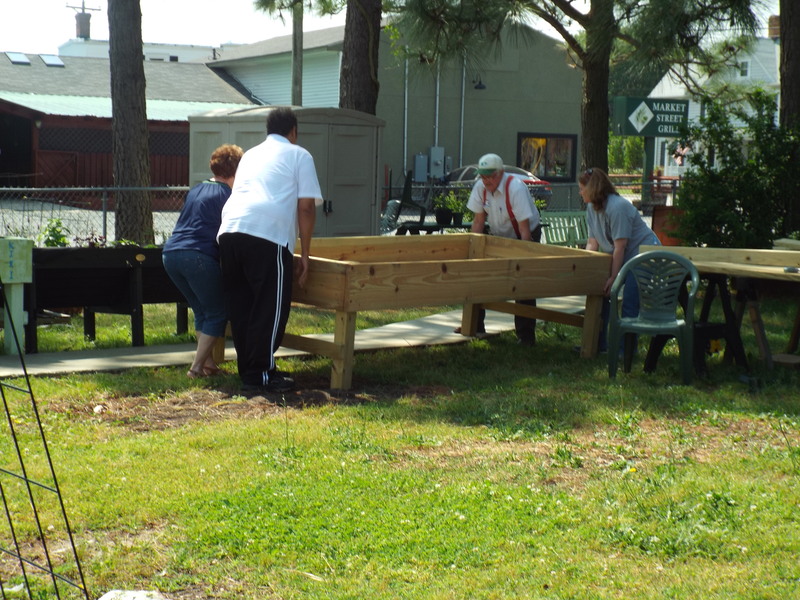 The raised bed was built with materials funded by our Community Gardens grant. 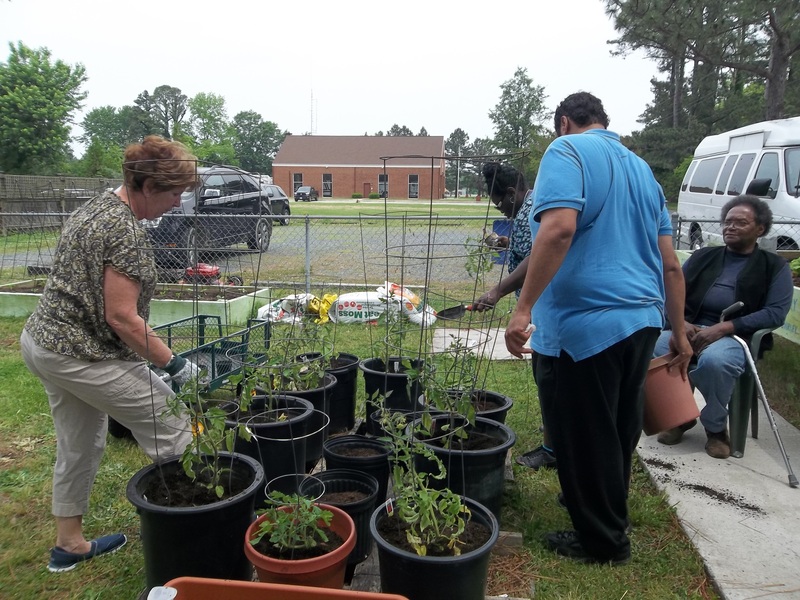 David helping David from the Food Bank to water some plants. 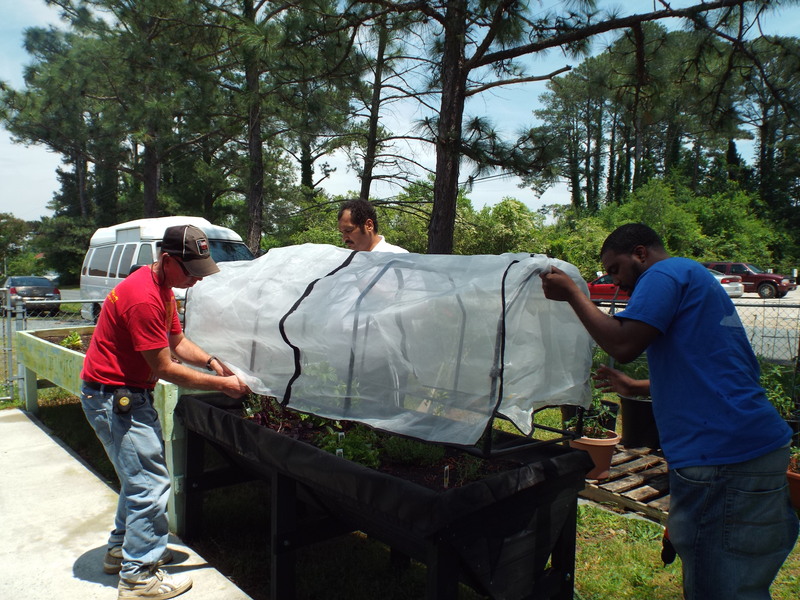 David, Zel, and Steve adding the bug screen cover to our dedicated herb garden to avoid bug infestation! 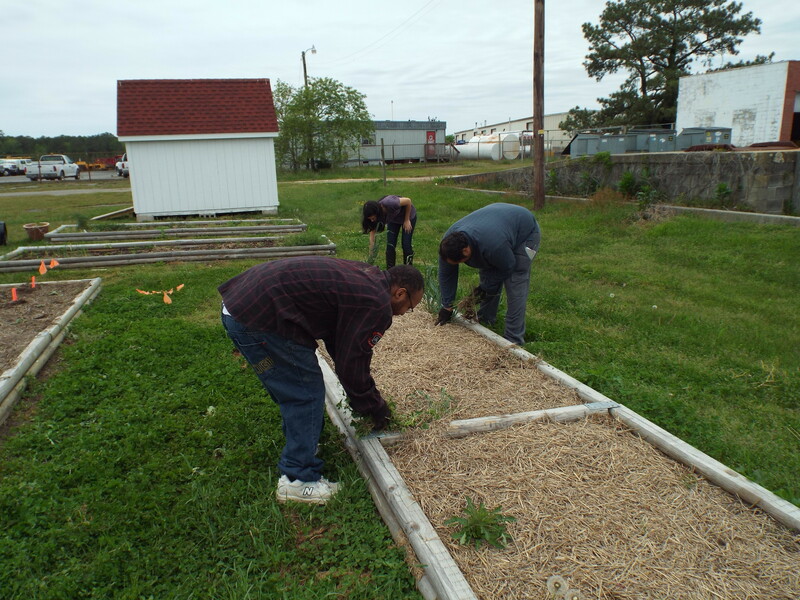 The herb garden was also funded by our Community Gardens grant. 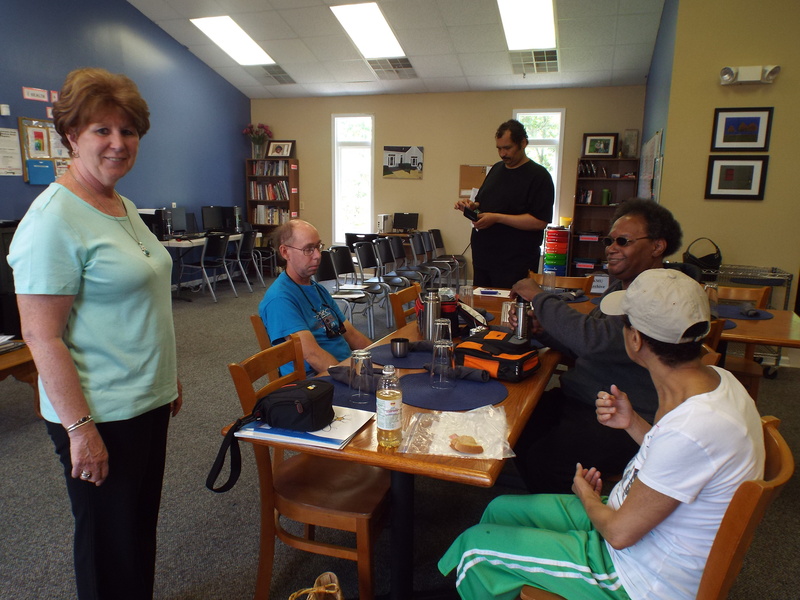 Maryann and David making some cookies to donate to G.F. Horne – I bet they will taste great! 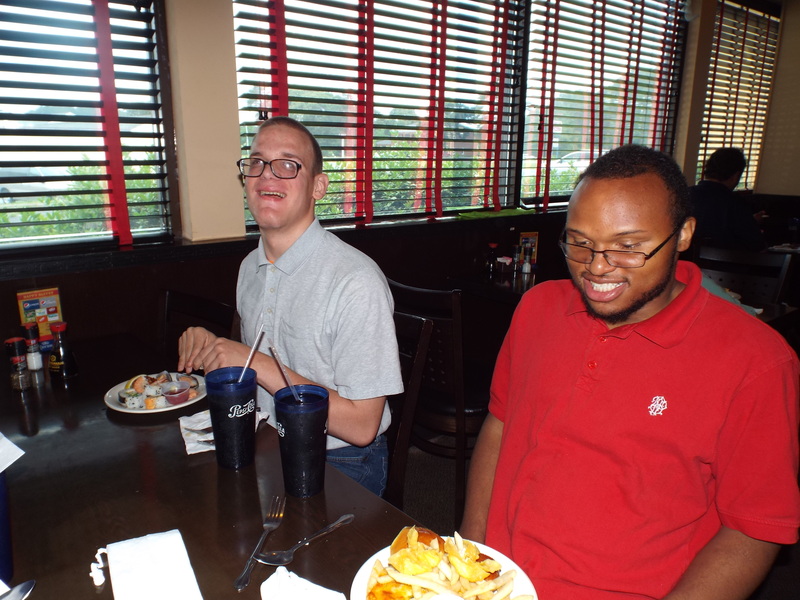 Brandon and DJ about to eat some delicious food during our lunch out trip to Happy Buffet. Looks nice guys, I bet it tastes good! 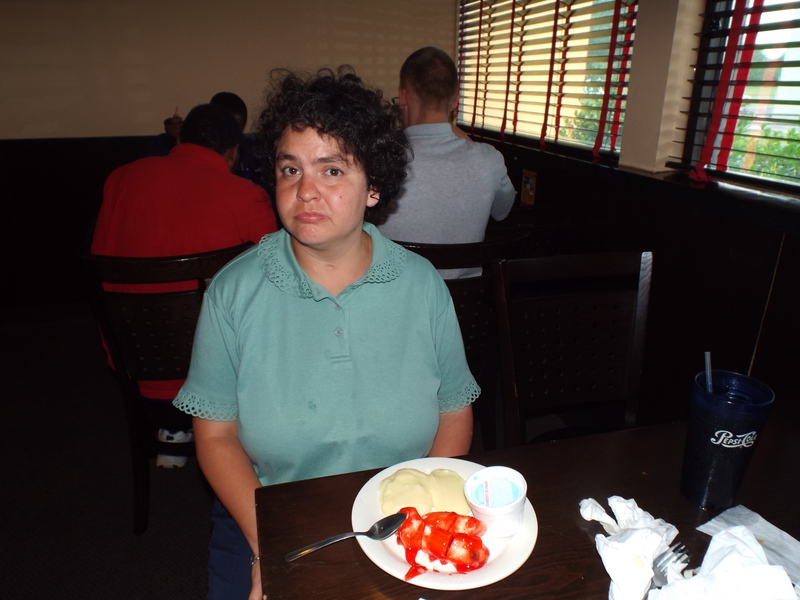 Beth getting ready to enjoy her dessert from Happy Buffet. She said it tasted really good and was one of the best desserts she’s had! 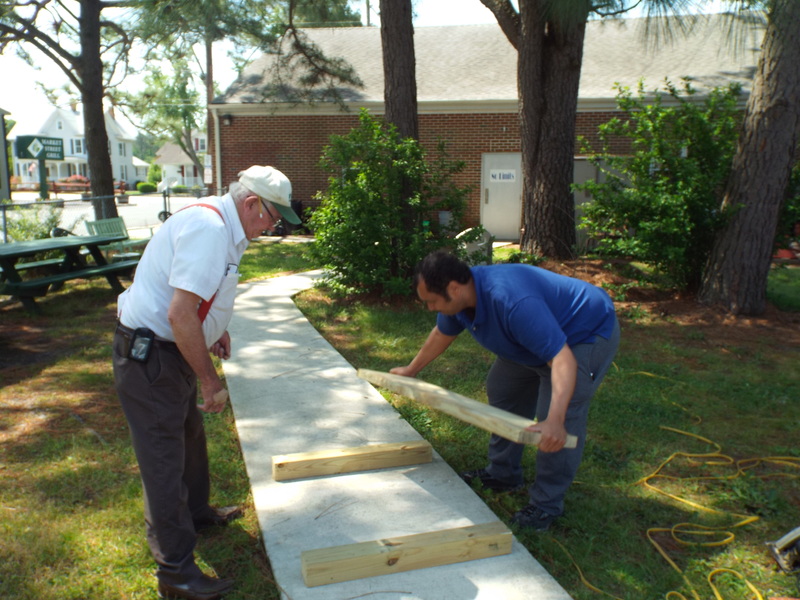 Philip and Zel building our new raised garden box with materials funded by our Community Gardens grant! Build on my boys, build on! DJ volunteering at the food bank. Work on DJ, work on with your bad self! 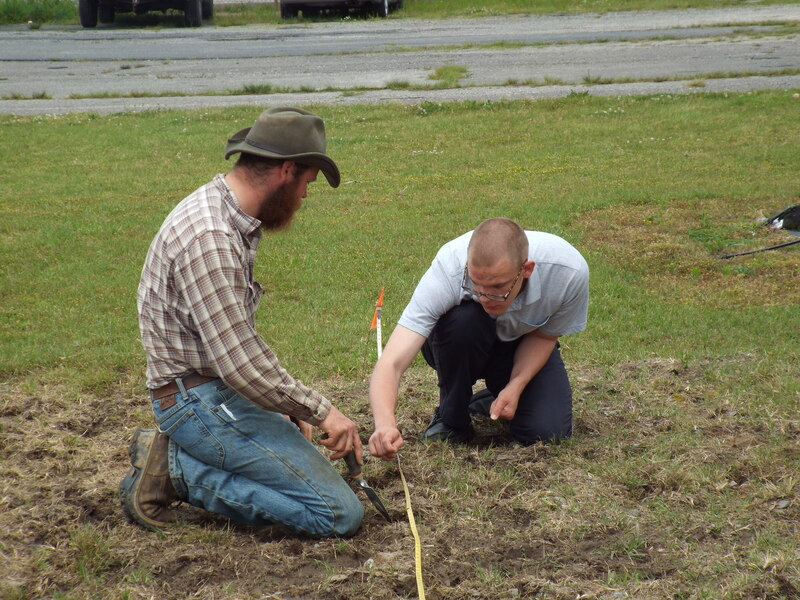 Brandon helping David the farmer plant some seeds while volunteering at the Food Bank. 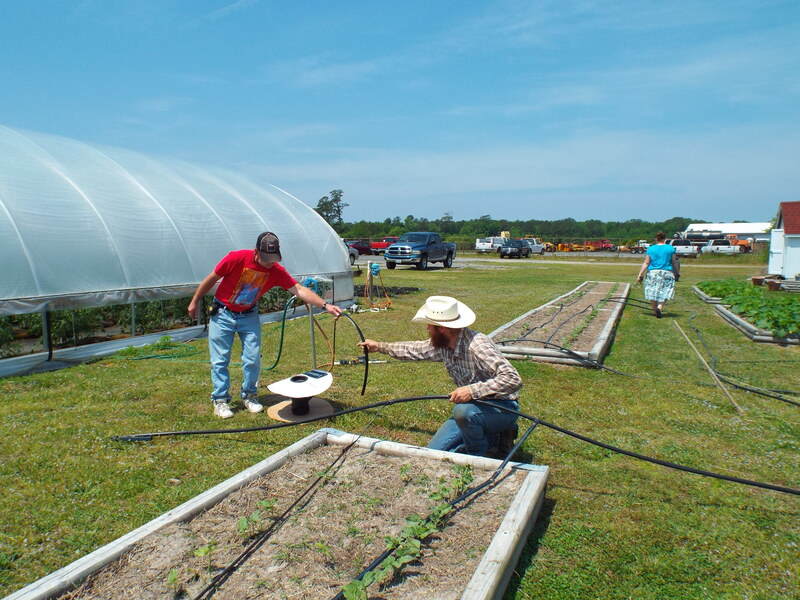 Brandon and DJ pulling the suckers off of the tomato plants while volunteering at the Food Bank. 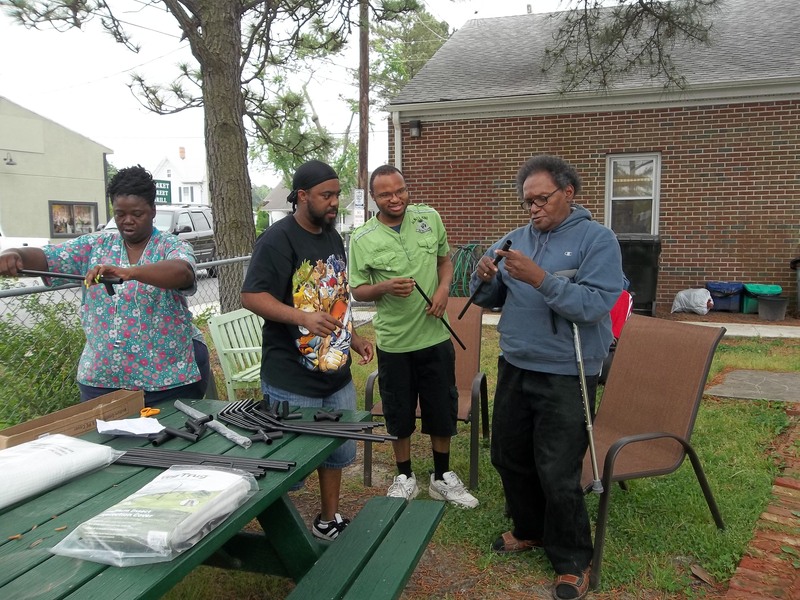 Work on my people, work on! 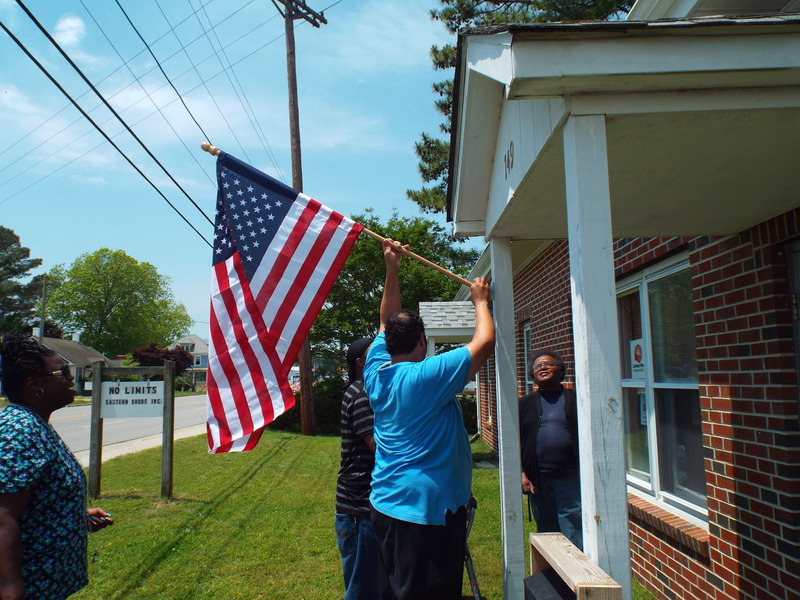 We bought a beautiful American flag to put up here at No Limits. God bless America!!!!!! 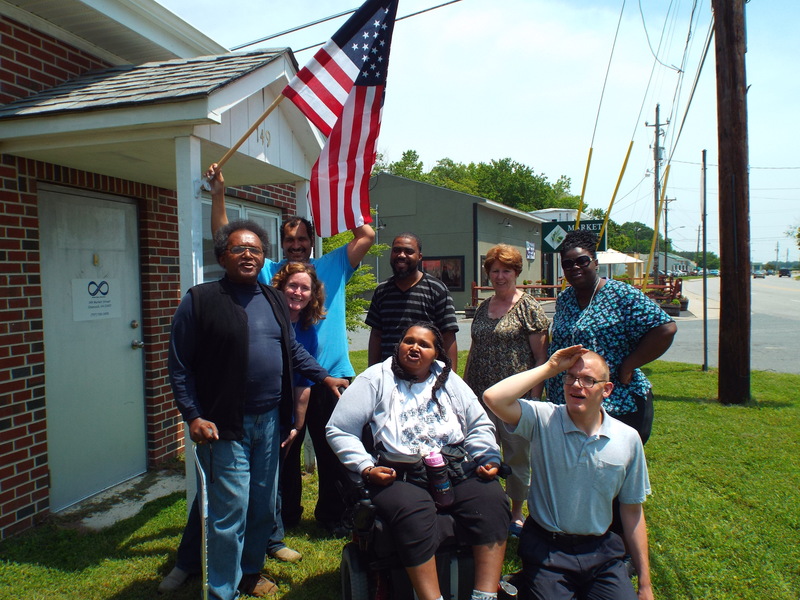 The group wanted to pose for a picture with our new American flag. Lookin’ good everybody! 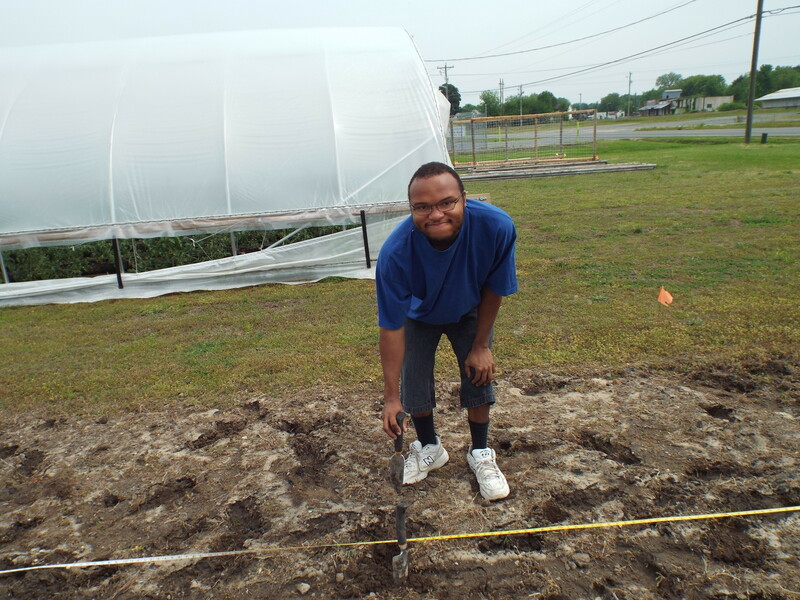 We got all of our tomatoes planted this week and we can’t wait to see them grow. Save one for us please now! Amy and Zel posing for a picture with some of the garden plants. Lookin’ great guys! You’re the bomb! 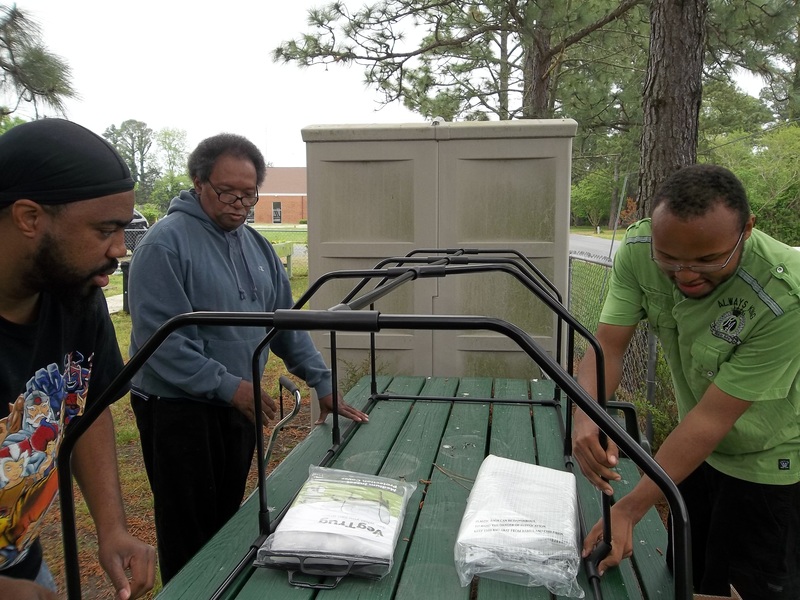 Sherry, Steve, DJ, and John putting together our brand new VegTrug! Superior work guys! 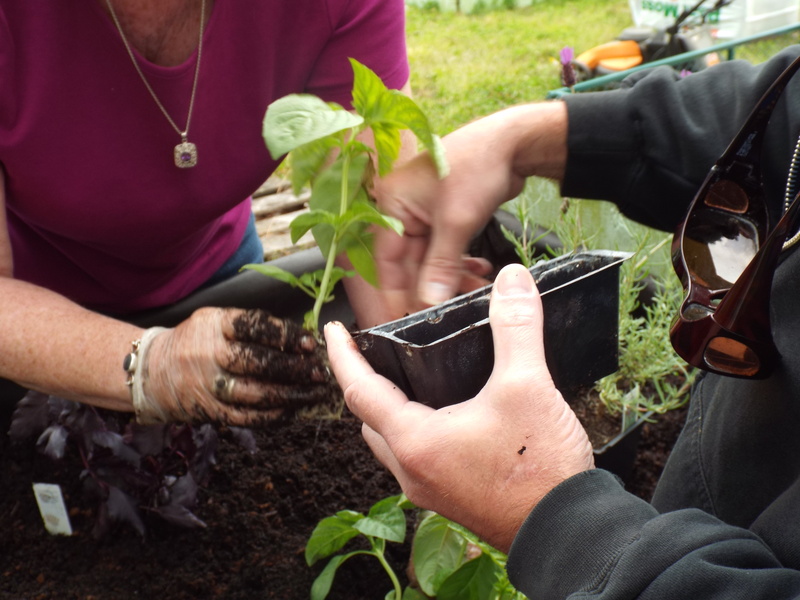 The VegTrug will hold a dedicated herb garden funded by our Community Gardens grant. 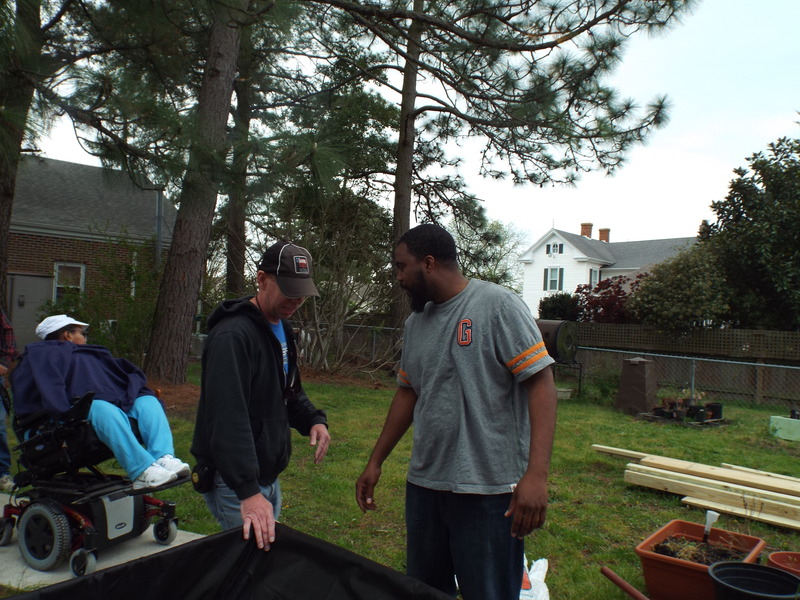 Steve, John, and DJ putting the finishing touches on the VegTrug! 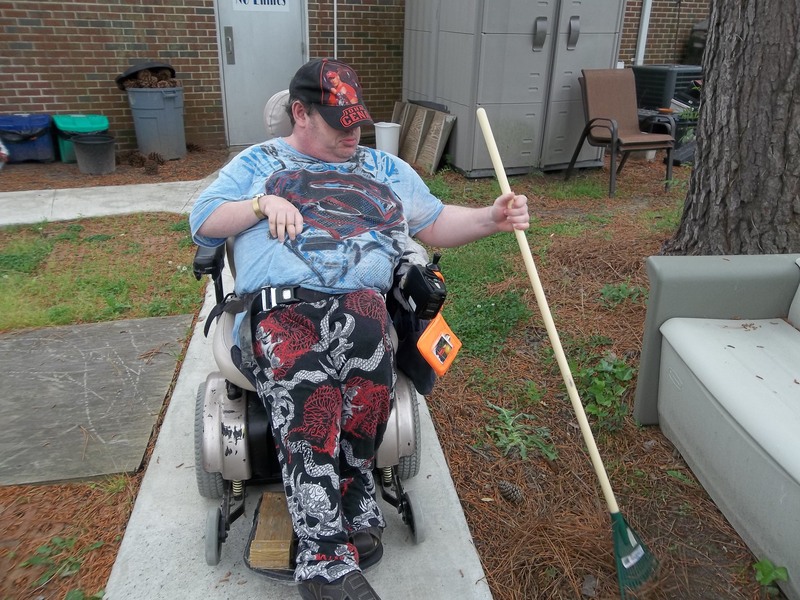 Matt raking up the yard – hard at work! 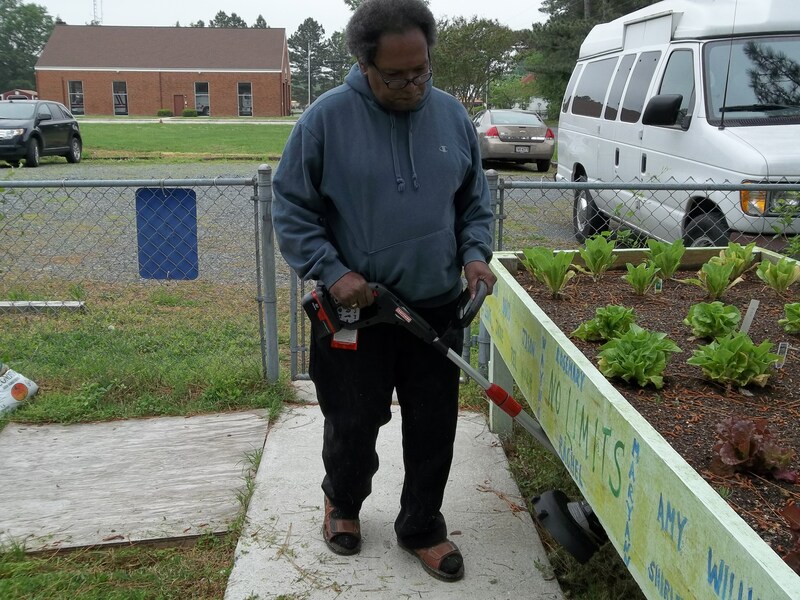 John the weed whacker! Go John! 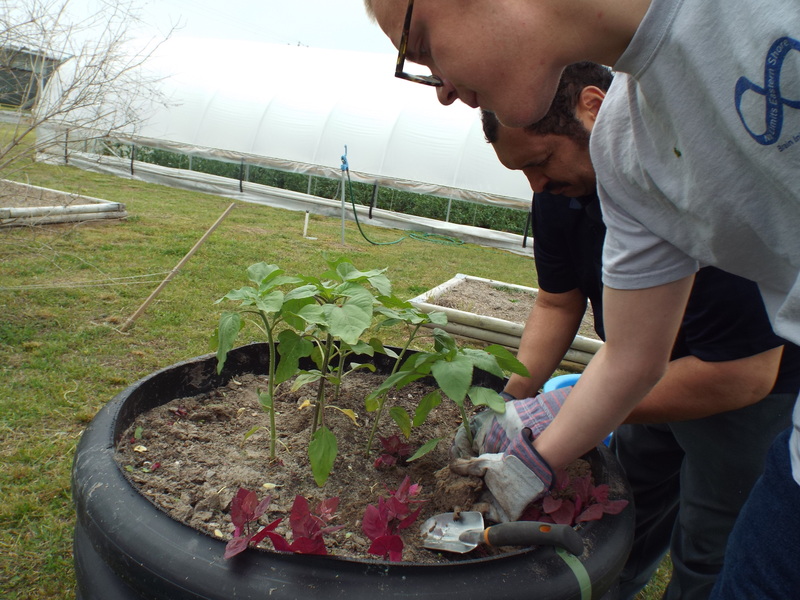 Brandon and Zel transplanting a sunflower plant at the Food Bank last week. Plant on boys with your bad selves! 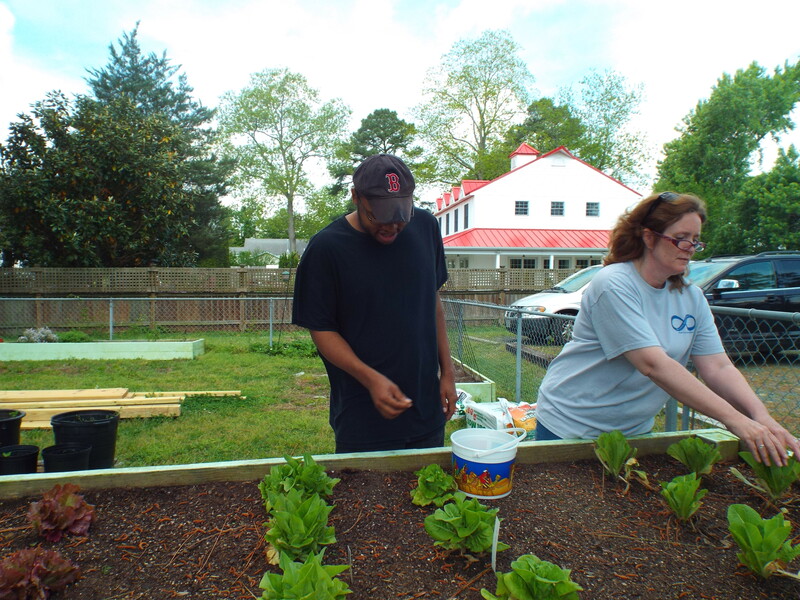 DJ and Rachel gathering some lettuce for our lunch making day last week! Look out for the rabbits and no fighting over the delicious leaves! Mmm mmm! That lettuce looks delicious! 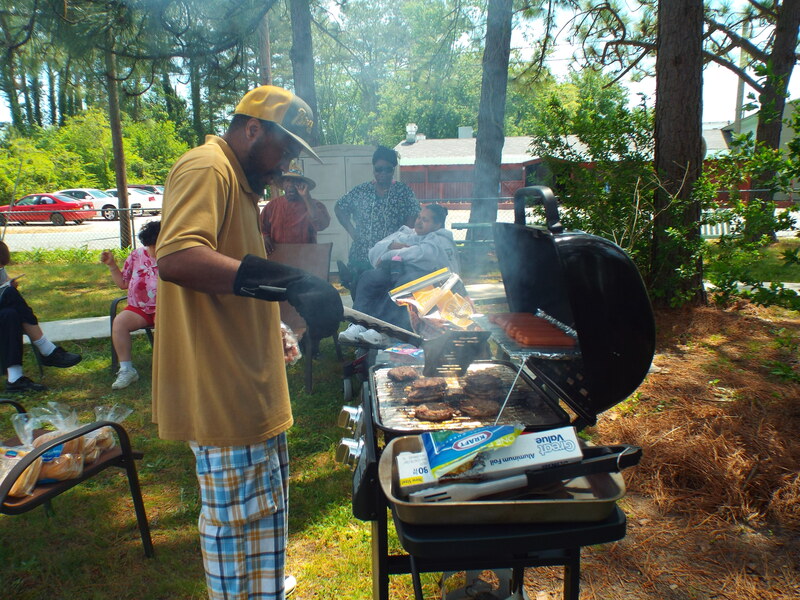 Save some for us DJ! 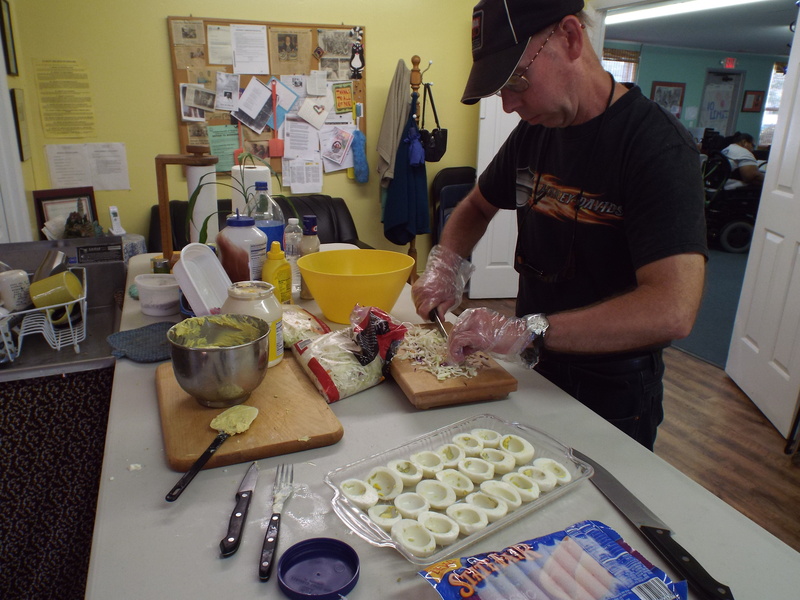 David chopping up some coleslaw for our lunch making day! Be careful David, and save some for us! 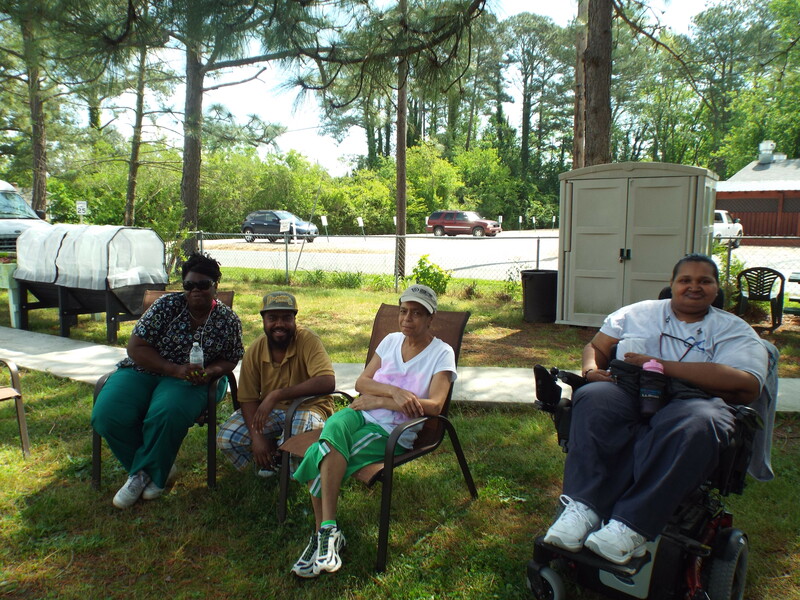 Sherry, Steve, Diane, and Amy hanging out in the yard waiting for lunch at our annual cook out! 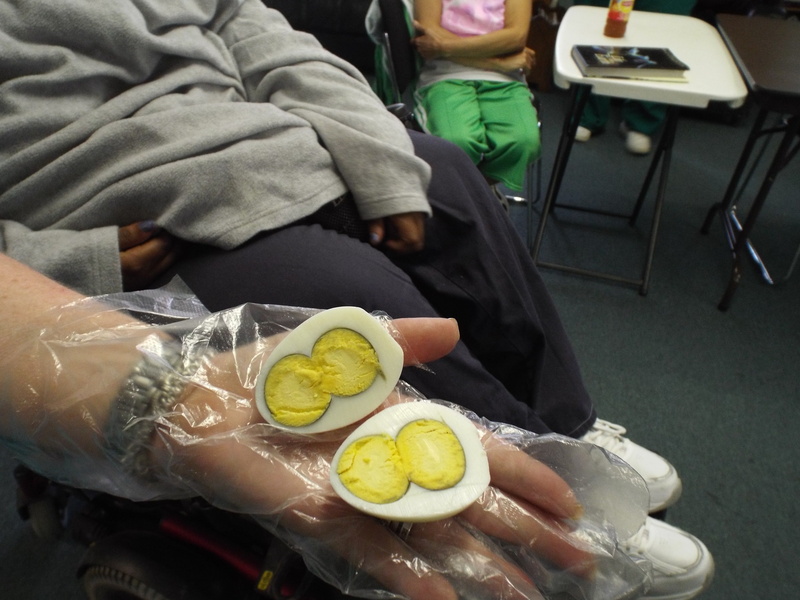 We hard boiled one of our double yolked eggs from our hens! Double the pleasure, double the fun, double the flavor for your tummy tum tum! Grill on Steve with your bad self! More please! The group waiting for lunch to be ready. Give us some food please, we’re hungry! No Limits has closed early today due to flooding. 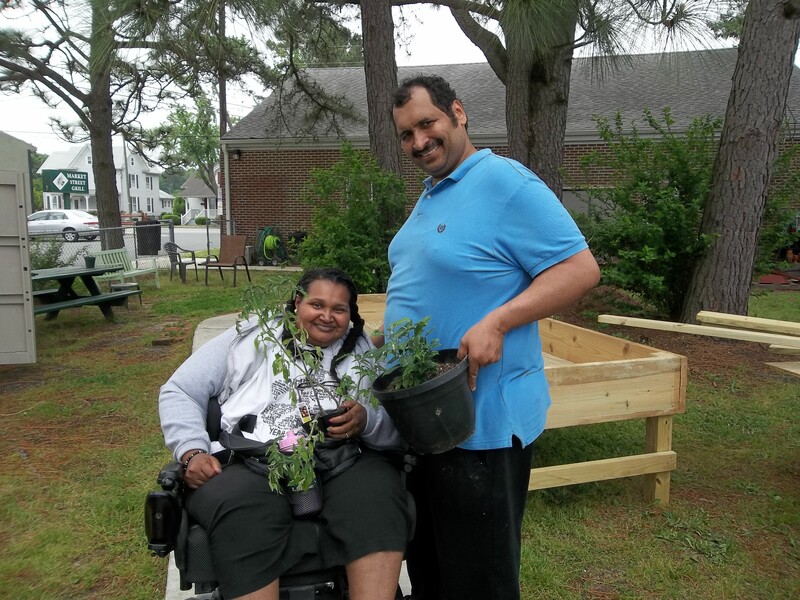 Our newest member John helping Zel set up our dedicated herb garden funded by a grant from Eastern Shore Healthy Communities. Work on men, with your bad selves! Don’t hurt nobody! 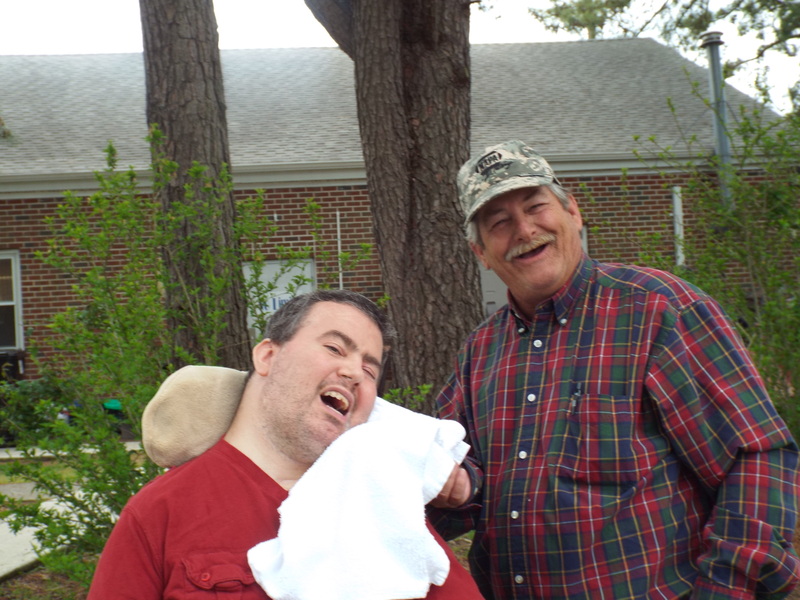 Jason & Chris – tell us what’s so funny please! 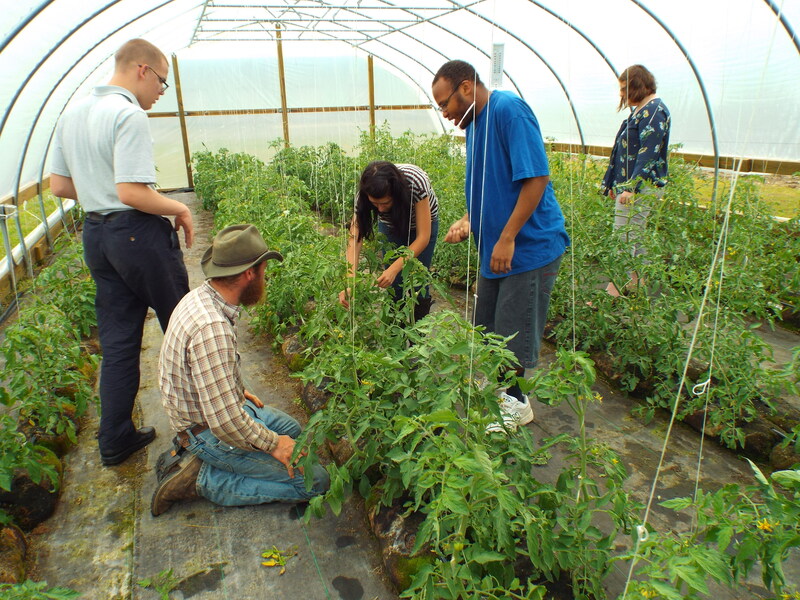 Look at our beautiful lettuce…mmm, mmm, we’re hungry now! 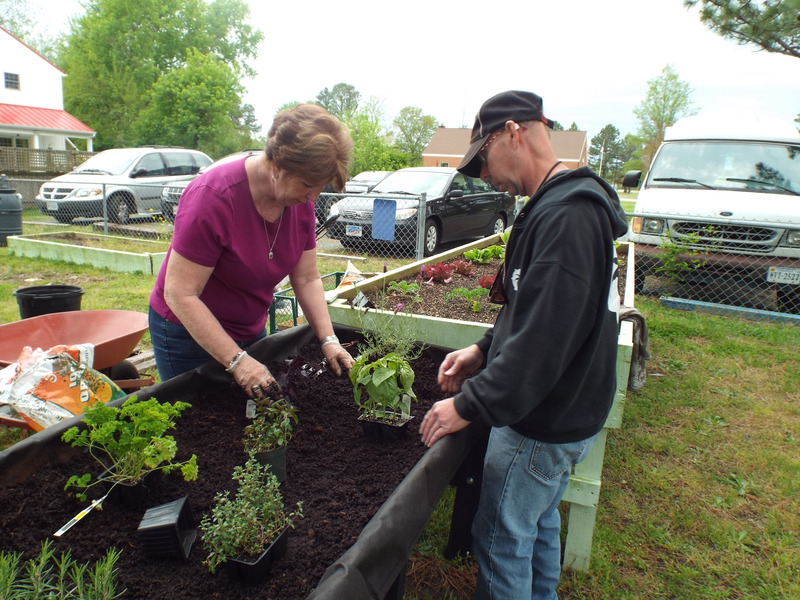 David & Maryann working on the herb garden – y’all can season us up now please! 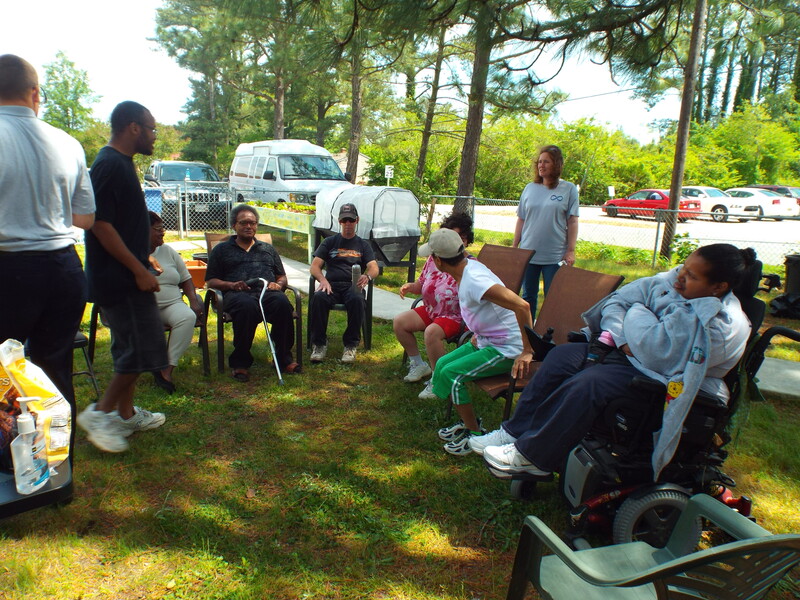 Maryann, David, Zel, John & Diane visiting the Denbigh House this week – thank you guys for your hospitality! It was great to meet you! 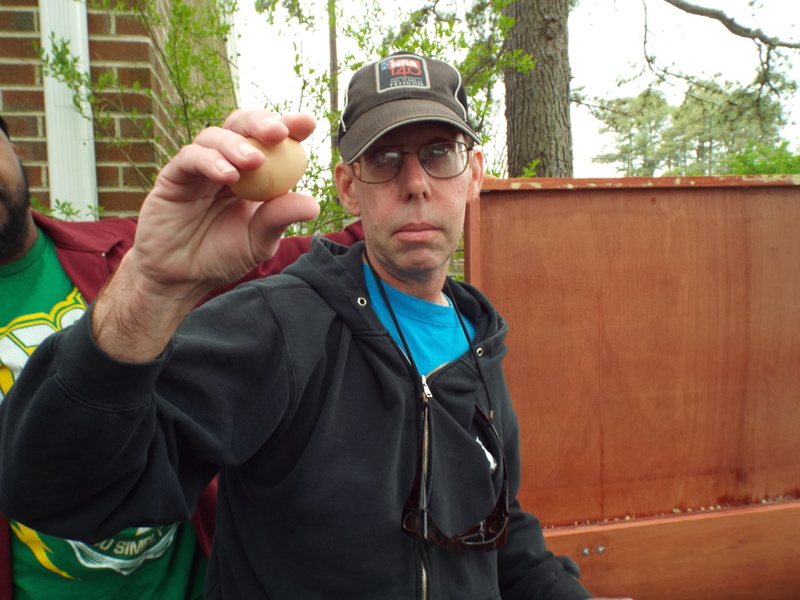 David and an egg! Congratulations on your egg! 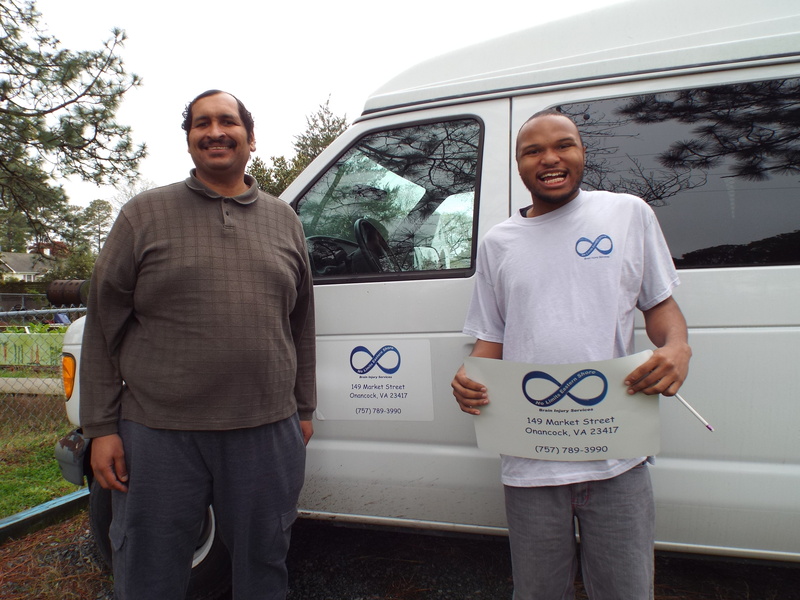 DJ & Zel installing our new van signs, yippee!! 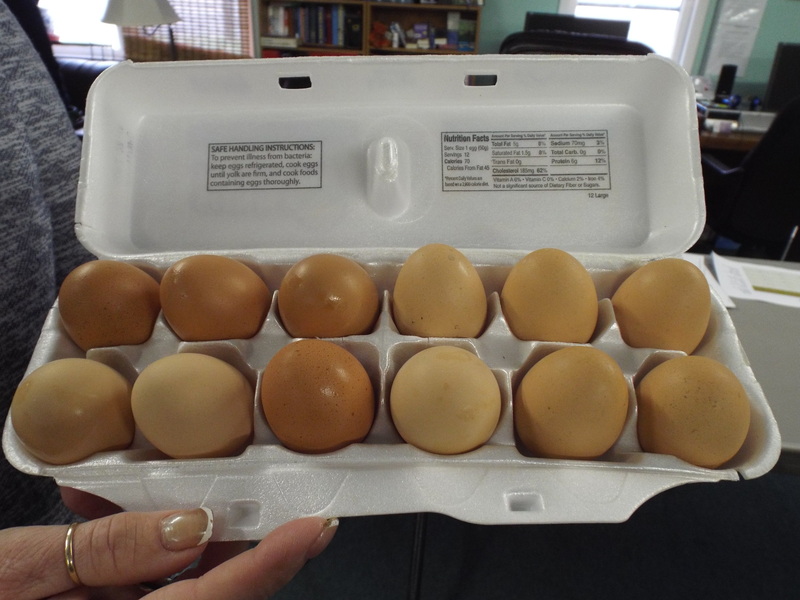 A full dozen eggs!! More please ladies – no rush, just more! 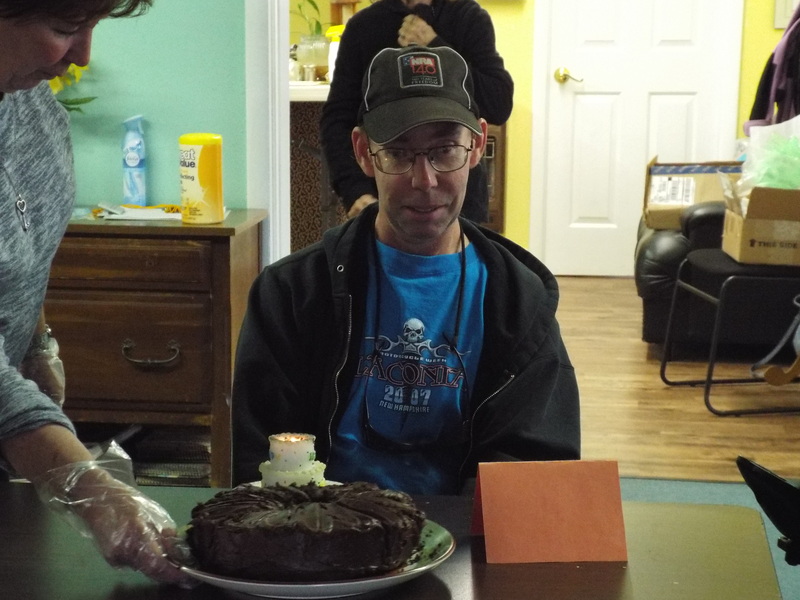 Happy Birthday to David, and many more – share your gifts (to me)! 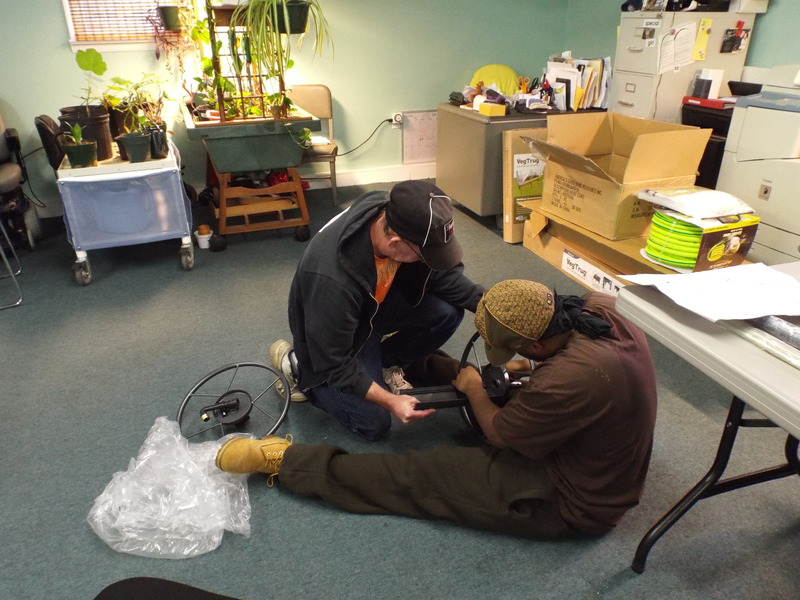 David & Steve building the accessible hose reel we purchased through our Community Garden grant from Eastern Shore Healthy Communities/Eastern Shore Health District. 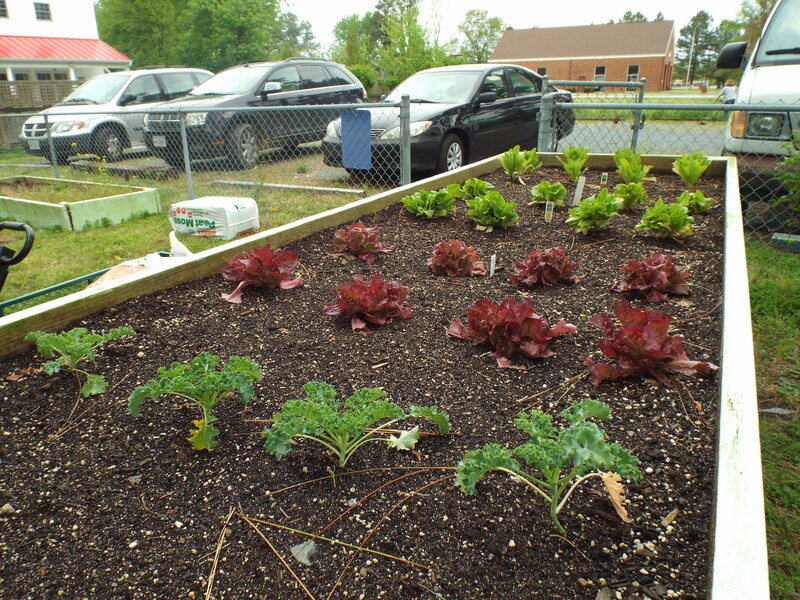 This is just part of all the wonderful things they are providing to help with our Community Garden! 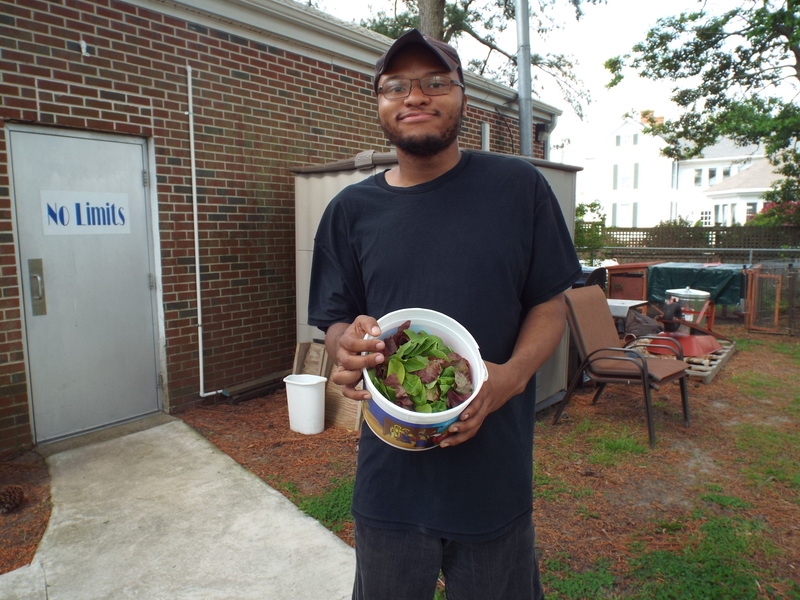 Our neighbor Nuri (owner of the Market Street Grill) bought our first dozen eggs, yippee!! Go ahead with your bad self!